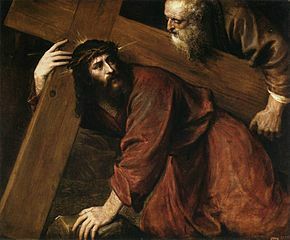 Yes, "'If anyone wishes to come after me, he must deny himself and take up his cross daily and follow me'" (Lk 9:23). Yes, "I have the strength for everything through him [God] who empowers me" (Phil 4:13). But maybe no—quite possibly no—"God doesn’t give you more than you can handle." It’s a popular quote ... but not scriptural. It’s religiously cultural and, most times, meant to be helpful. Comforting. Encouraging. Empowering. On the other hand, perhaps like Jesus on his way to Calvary, you need some help. Perhaps, as a caregiver, sometimes you need your own "Simon of Cyrene." And perhaps sometimes the strength God is giving you is the wisdom and courage to ask for help from others. To accept the help others offer. So, yes, it can be said God never gives you more than you can handle because he gives the rest of us the opportunity, the privilege, and the obligation to help you. For some suggestions on getting help, see "Exhaustion: Care for the Caregiver." As a topic here, and printable flier here. Lord, thank you for choosing me to be a caregiver for my loved one. Help me ask for help when I need it and accept it when it’s offered. Help me to find what’s best for him (her) and to recognize it when you show it to me. Amen. This week we're so pleased to welcome Nancy B. of Minnesota, Irene S. of New York and Servi C. of Louisiana as the newest members of the Friends of St. John the Caregiver. Please keep them and their intentions in your prayers. They have promised to pray for you and yours. This site is designed for family caregivers. Here you'll find spirituality, information and resources for Catholic caregivers.